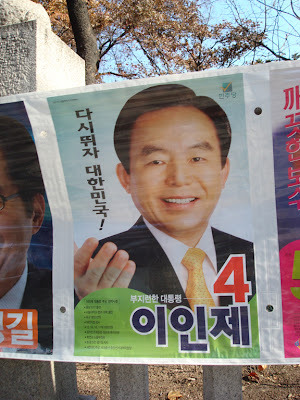 UPDATE (20 December 2007): Lee Myung Bak, Number 2, has been voted in as the next president of South Korea. Today is the BIG day! 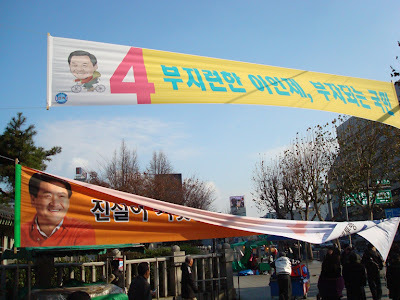 Presidential election day in Korea! 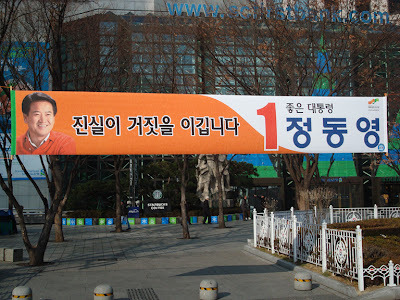 Banners like these are all over Seoul. Each presidential candidate has a unique identifying number 1 through 12. 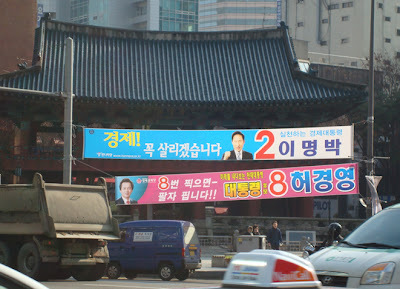 The general consensus is that Number 2, Lee Myung Bak, is almost certain to become the next president of Korea. Sorry number 8! But, will he best for the Korean animation industry? I don't think so. I think Number 1, Chung Dong Young, will be better for the animation industry in Korea. Number 1 made a publicity visit to our animation studio last Friday. I guess this means he supports animation and the arts. All it personally meant to me was that I had to tidy up my desk for the cameras. . . But watch out! Putting Number 1 to shame is Number 4, Lee In Je. Look at him zipping high in the sky as Number 1 cowers below. What better for the Korean animation industry than having a cartoon character for president! Imagine how many jobs that will generate! His inauguration alone would require tons of background designers, layout artists, color specialists, story boarders, and so on. So, I say all animation people should vote for the one and only cartoon candidate. Just look how healthy and diligent he is. Okay, I don't want to fool you. He's not really a cartoon character. Here is a real life picture of him. 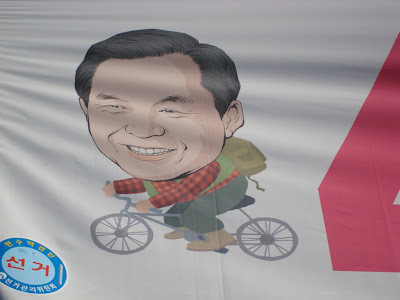 However, I think it is really cool that he used a cartoon representation of himself for his campaign. May the best man win!